I’m excited to let everyone know about a brand new Sci-Fi platform. A few weeks ago, me and some buddies came up with an idea to bring together Sci-Fi authors from every background — traditionally published and independent writers, as well as bestselling and emerging authors. Sci-Fi Bridge is dedicated to bringing readers exclusive access to some of the best science fiction authors around the world. We believe it will be an awesome opportunity for readers to become acquainted with their favorite Sci-Fi authors, and ones they may not have ever heard of before who are putting out amazing stories. In order to celebrate the launch, I’m excited to bring you the 1st of 4 massive book giveaways! 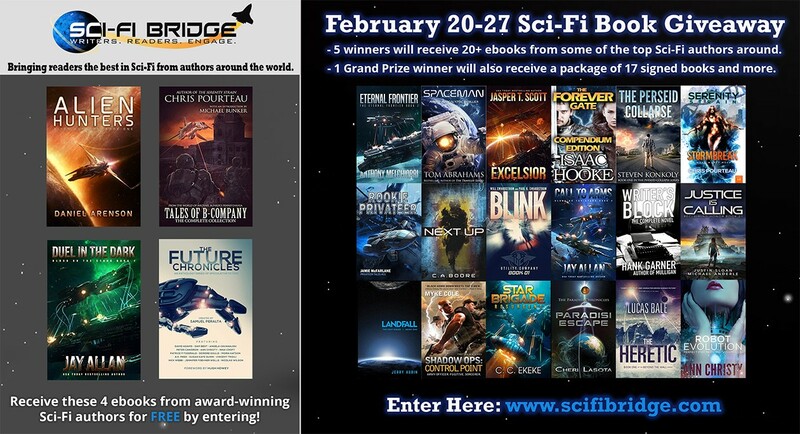 Everyone who enters between February 20-27 will receive four bestselling Sci-Fi novels FREE upon signing up. 5 winners will receive 20+ ebooks from the host of amazing authors pictured below and 1 Lucky Grand Prize Winner will also receive a package of 17 signed books. That’s right, 17, including signed books from Tom Abrahams, Daniel Arenson and Samuel Peralta, as well signed full series by bestsellers like Jay Allan, Jamie Mcfarlane, Steve Konkoly, Myke Cole and more! All you need to do is enter through the link below. And stay tuned. Next month our March 20-27 Giveaway will feature prizes from authors such as Jen Foehner Wells, Felix R. Savage, Rysa Walker and many more!